No, I'm not suddenly going hydro, but it seemed like hydro folks might be most likely to know the answer to this question. 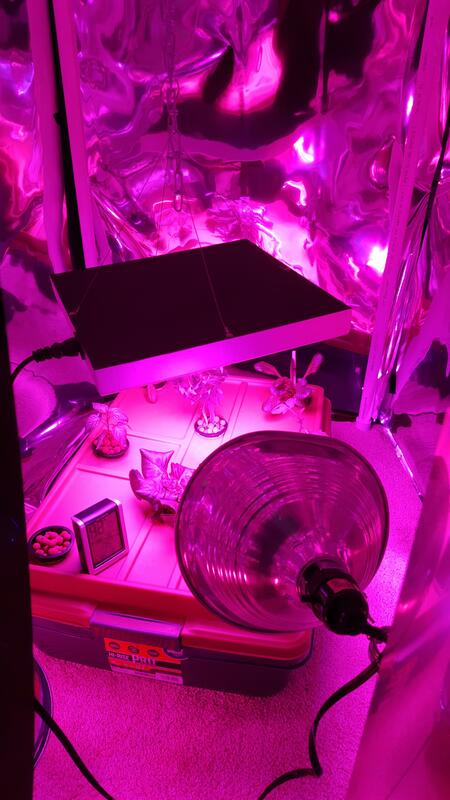 And the description of this Forum included "grow lights." I really want to be able to start some seeds this winter; I would never be able to afford all the plants I want for my blank slate yard. Anyway all my garden money will go for trees and shrubs. That means having the set up in the middle. (We have the motorcycle and the riding mower in one side of the two car garage; the cars can stay in the driveway, they are used to that.) I thought about trying to hang lights from the ceiling. (And nothing is ruled out yet.) But the garage ceiling is like 12 feet high (the garage floor is below ground level to the main level of the house.) So it occurred to me that the easiest solution would be if I could buy or make some kind of light stand. Criteria - I want it to hold 4 ft long fluoro tubes, at least two of them (four would be even better) and of course the light has to be easily raised and lowered. Ideally, it would be tall and wide enough that I could put my kitchen cabinets and counter top under it, so all the trays and pots would have a storage spot. And of course, I can't spend a fortune. But it only has one bulb and some of the reviews said it is pretty flimsy and wobbly. But I thought I would see if other people had suggestions . but of course I found it advertised for over $500 and I don't want to spend that. And plants couldn't get very big that way. This would be cheap. It was for a hydro system, but wouldn't have to be. But not real easy to raise and lower the lights. He did that by adding and removing lengths of pipe. And not stackable. OK.... maybe closing in on it. but $200 for the shelving unit, plus a whole bunch of light fixtures and bulbs. I guess I'm just in sticker shock. The set up I had before, I built piecemeal over years, so I never had to lay out all the cash at once. ...also, I was checking CRAIGSLIST with renewed recent interest -- I look under free stuff, farm/garden, materials, household, and general.... And I noticed some used industrial shelving offers -- a tad expensive, mass quantities, and 4 feet depth so not applicable for your purposes, but there might be others. Definitely lots of used kitchen cabinets.... What about a China/hutch? Also, I was thinking what about 3 ft x 14"-18" units grouped into a U shape? --- | | would that work? If this configuration allows light fixtures to be hung, then grouped and lashed together (zip ties etc.) shelving units would be less likely to fall over. Would something like this work? Dowels were used in the slots in the frame to adjust the lights. It accommodates two-foot lights, but you can easily do a plan for four-footers. The lights are raised and lowered by chains. I wanted wide spaces between the shelves. Your plan doesn't have to be as tall or it can have more shelves. If you use Schedule 40 PVC, it has a thicker wall and so it's more sturdy than Schedule 80 PVC. I saw some pvc ones too but I like yours. I do use pvc over my orchid benches for shadecloth, but I have problems since they are not glued with them shaking apart in the wind and the neighbors invasive plants sitting on them causing them to collapse. How much weight can the pvc shelf tolerate? As for hydroponics. Can't help with the light issue. The hydrobeds are in a hydro house with either clear or opaque panels so the daylight comes through. Electricity is needed only to run the pumps and the fans. I don't know how much weight. Both the top and middle shelf have been full of plants (I don't have the light fixture for the bottom shelf yet) and I lean a bit on the middle shelf to work on the top shelf and it's been quite sturdy so far. I used 3/4-inch Sch 40 PVC. Before I built it, I was wondering if the 3/4-inch would be sturdy enough or if I should go to one-inch. My husband assured me the 3/4-inch Sch 40 would be fine and he was right. If you do something similar, you can use one-inch in the Sch 40 PVC to be sure. What schedule is the PVC you use on your orchid bench? If it isn't the thicker-walled PVC, it can be quite wimbly. If you take a length and bend it into an arc, it isn't the thicker-walled PVC. The joints are glued very minimally. I didn't use primer and just used a dab of glue at each joint. Since it doesn't have to carry water under pressure, priming and thoroughly gluing was not necessary. The better part of a little $4 can of glue is left over for the next shelf (and probably the next few shelves) I make . I am using schedule 40 and I have some grey pvc with threads that are thicker they just don't make good corners without a couple of adapters. My frames are 4 ft x 4 ft x3 ft. It might work better if I used the 3/4 inch instead of the half inch. I knew I could count on all of you (or y'all as they say in my new location ) to come up with some good suggestions! And clearly sometimes my thinking does get stuck. I have used the set up I had in two different locations (first was a more primitive version) for over 15 years. I was having trouble getting past the image of how I have always done it, to open up my thinking. So now I have lots of good ideas and a few months to sort them out and decide what works in my situation. I will let you know what I come up with!!! In the meantime, applestar, I think you have experience starting seeds in chilly conditions. This will be in the (so far) unheated garage at least this first year. No power to the shed and it would cost a lot to run it out there. I will have heat mats, so the soil can be warm. But once seeds are sprouted, how cool can the air be for them to grow? It won't be as cold here as Cincinnati, but we do still have winter. In Feb, when I am likely to be starting, average low temp (in Chattanooga a few miles away) is 32 at the beginning of the month and 37 by the end. But of course there are always days colder than average. .... I can put a space heater in the garage. If I have to, I can try to rig up a grow chamber with the seedlings and the space heater inside it, but that's more work than I really want to do. What do you think? Ooh! I'm sorry! I did see this but it slipped my mind last weekend, and then I managed to catch a bug from messing around outside and overexerting myself. Overall, it's easier to germinate/sprout seeds that need really warm conditions like tomatoes etc. in warmer temp indoors first. Brassicas and other cool temp seedlings can be put out in near freezing temp. Once sprouted, tomato seedlings can take temps down to 40's though once they have a couple of true leaves, they actually get more cold sensitive, and if you see them get purple all over and yellow, they are in danger of getting stunted. (I pushed this envelope this spring and lost some -- they never recovered from the stunting). They are better off in 50's or above. I think I had better results when I was experimenting with using Christmas lights, but they made me too nervous. Heating pad can make the difference and while the lights are on, the air temp is raised too. I do cover the entire set up with plastic sheeting in the depth of the winter, and use that mylar covered foam windshield reflector in the front which I think insulates them a bit. Maybe a single incandescent bulb is all you need under the cover. Be prepared for things to grow slower in the colder temperature. Currently, my cobbled together garage V8 Nursery is set up on an 80's Lane black lacquer with brass trim dresser with a matching large mirror, against the house side wall with wire wall shelving just outside the laundry room -to- garage people door, and the bicycles are stored in the front of the garage just inside the garage door, which makes it difficult to transport the plants outside -- I have to use the 2nd garage door for the 2nd bay. That has to be one of the benefits of moving. You really do get a fresh start knowing what you have and where everything are and within access. How many seeds are you planning on starting? And how long will the be growing indoors under lights? I would recommend the investment in LED lights if you can. They will last longer than T5s or florescent and they don't put any heat off so I feel safer leaving them unattended at times. Not to mention LEDs are much more efficient. Depending on how many plants you're starting and weather they will be staggered or different type you will need separate areas, either horizontal or vertical would work. Neither can save you on lighting - just space. My indoor hydro set up is made of pvc (basically a box) and lined with reflective paper to maximize lighting and help increase temp and humidity. I have the light on an adjustable chain but since I made a dedicated seedling zone with its own light I haven't had to adjust it yet. I don't have a great picture of my set up but this is the general idea. I'll try and take more tomorrow. LiteStik plant light, Decent Temporary Light Source? What bulbs make red light? Is this light sufficient for hydroponics?